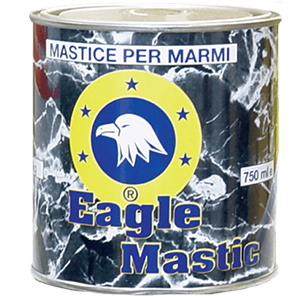 Eagle Mastic (2-components polyester) is a synthetic resin-based adhesive with a specific weight between 1.1 and 1.65 gram/cm3. • Specially formulated for use in gluing and filling of all types of marbles, stones and granites. • Suitable for all types of work, including anchoring of anchor bolts. • Used most of all in the building industries, especially for natural marble and/or stone coatings and floors. • Used to fill joints of the floors made with marble slabs so that after hardening, the surface would be ready to be polished.